The lightning visit by Israeli Prime Minister Benjamin Netanyahu to Moscow is a clear sign that the outcome of the Syrian quagmire is far from being carved in stone. It is also evidence that Moscow is regarded, rightly or wrongly, as one of the arbitrators of regional rivalries. The agenda of talks between Russian President Vladimir Putin and Israeli Prime Minister Benjamin Netanyahu, which took place in Moscow on April 21 during the latter’s one-day visit to the Russian capital, was unsurprisingly dominated by the still pervasive regional disorder and persistent unpredictability of the situation in and around Syria. With emboldened Syrian ruler Bashar Al-Assad now calling the shots and displaying a certain intransigence in what is so far a painfully unproductive inter-Syrian dialogue, Israel is understandably apprehensive about Assad’s beefed up armed forces, now on the offensive. According to Tel Aviv strategists, there is a fair chance that the diplomatic pressure mounted recently by Syria for a return of the Israeli-occupied Golan Heights (Golan) and a return to the borders of June 1967 might be backed by the threat of a military incursion. The United Nations regards Golan as part of Syria, which it was prior to the 1967 Six-Day War, when Israel seized the territory. Tel Aviv says property rights to Golan are not up for negotiations. One of the down-to-earth explanations is that occupation of the Golan gives Israel access to the Sea of Galilee, its main source of fresh water. No less worrisome for Israel is the re-activated deal to supply Iran with Russian-made S-300 surface-to-air missile systems. Netanyahu has repeatedly voiced his refusal to accept the nuclear deal reached in July 2015 on the Iranian nuclear program. For Israel, he has claimed more than once, Iran poses an “existential threat.” The sales of sophisticated military hardware to the “mullahs” are viewed as a direct menace. In this case, Russian authorities could have comforted Netanyahu by referring to the defensive character of the S-300, meaning it has no first-strike capability as such. As for assurances that Syria will be properly pacified and turned into a stable, good-natured neighbor, no one would be bold enough to sign up to such a positive scenario, neither in Moscow, nor anywhere else. At least, for the time being. But this is not good enough for Israel. As Grigory Kosach, an expert on the politics of the Arab world and professor at the Russian State University for the Humanities, explained to RBTH, this is one of the main motives for the Israeli prime minister’s visit to Moscow this time. “Take notice: This is the third visit by Netanyahu to Moscow in just six months. 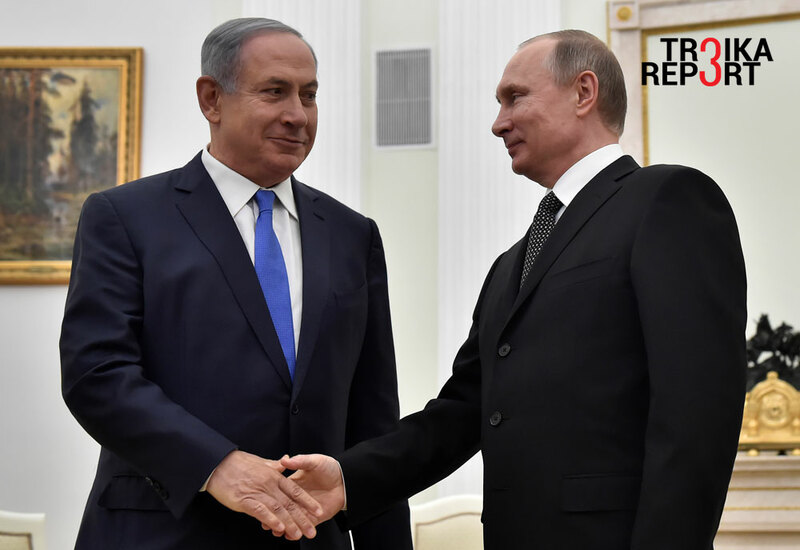 The impression is that Russia has failed to provide sufficient reassurances that Israel’s interests will not be affected by the developments in Syria and the region as a whole. – What is the rationale of coming to Moscow, which does seem to have any influence with Tehran or even with Damascus, as you say? The shape of tomorrow’s economic bilateral relations, although subordinate to the issues of national security due to the “unfinished business” of neutralizing extremists and militants in the region, as well as implementing a formula for resolution of the conflict in Syria, featured on the agenda. One element in this dossier, with a piquant regional context, is worth further scrutiny. The ruptured economic cooperation between Ankara and Moscow after the downing of the Russian Su-24 jet in November 2015 has created a void due to the abrupt cessation of supplies of food and agricultural produce delivered by Turkish companies. The gap has not yet been filled. This tempted Israeli Agriculture Minister Uri Ariel to make a statement during his recent visit to Moscow that Israel would be eager and ready to substitute Turkish goods, not limiting the assortment of exports to oranges and tomatoes. Israel is entertaining the idea of providing Russia with the agricultural technologies for which it is justifiably famous. – Will the surge in Israeli exports hinder the Russian government’s policy of food import substitution that emerged as a by-product of the Western sanctions? “Not in the least. This segment of trade developed into a two-way street a long time ago. For example, Israel has been importing Russian lamb, an ecologically unspoiled product because it originates from the region of Kalmykia, which has not yet tasted (fortunately!) the adverse side effects of agricultural chemistry. Moreover, Israel is a steady and solid purchaser of Russian grain[Russia holds 15 percent of the global grain market – RBTH].Israel did not join the Western sanctions. In sum, Tel Aviv is apparently seeking guarantees from Moscow that neither the current brewing chaos in Syria nor the country’s theoretical resurrection as a unified state presents a threat to the status quo and challenges the national security of Israel. However, Russia does not seem to have weighty leverage to engage with the leader of the Syrian regime, who is both master of survival and a more or less efficient manager of a patchy nation. Moscow could make pledges, which it would definitely honor, to deliver additional cargoes of eggs. But it can hardly sign up to promises of a certain type of governance to emerge in Syria after ISIS is defeated and Syrians of all beliefs and convictions enter jointly into the post-civil-war period.